Yesterday I went on my first ever daytrip with the trampey club, which was a nice little milestone. 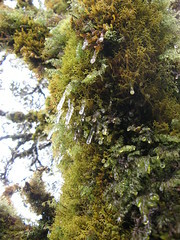 We went for a walk around the Kapakapanui loop track in the Tararuas. This track begins at the Ngatiawa road-end, east of Waikanae. It climbs (and then descends) about 1000 metres, and is probably about 10 kms in length. People: Bronwyn, Mike, Michelle, Éamonn, Peter, Sarah, Becky, Sally, Claus, Jo, Annemarie. Intended route: Start at the road-end, follow the loop track clock-wise up to Kapakapanui Hut, continue to Kapakapanui Trig, then continue back down to the road-end. We left the road-end at about 9.40am, after a few minutes of checking maps and so on. (I calibrated my altimeter at 160 metres, which seemed about right.) To get to the beginning of the loop, it’s necessary to walk along the Ngatiawa River for about ten minutes, all of which is marked with bright orange DOC track markers. The turn-off point from the river is marked with quite an obvious sign which points to both ends of the loop. The sign gives the option of climbing up a spur which divides the Ngatiawa River with another one that comes down from further east, or alternatively crossing the small river to the east, and walking up a different spur to Ngatiawa Peak, and then around through the rest of the loop. So we took the left branch to go clockwise around the loop. This wasn’t quite as steep at first, but quickly changed to be quite a rapid climb. Bronwyn’s idea was that if anyone in the group felt too exhausted by the time we reached Kapakapanui Hut, it’d be easier (and faster) for them to turn around and come back the same way. With 11 people in the group we were going at quite a relaxed pace, and we reached the hut at about midday for a nice lunch stop. There was some concern at the hut about how windy it was up on the tops, so most of us stopped to put on long johns or over-trousers before continuing. We finally got going a little before 1pm, and climbed above the tree-line about 15 minutes later. Although the winds were a little chilly on the ridge above the tree-line, it wasn’t too bad. 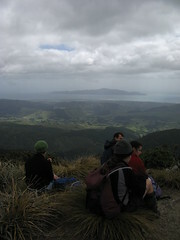 We reached the trig, travelling at quite a leisurely pace, at around 1.45pm, and then sat down for a while to get some snacks, take some photos of Kapiti Island in the distance, and stare at the snow-capped ridges over to the eastern side of the range. The overall temperature was still quite cold (down to about 2.5 degrees at one point according to my gadget watch), and there were still some thin scatterings of snow hidden under the trees behind the trig, as well as a few branches with small icicles hanging from them. Without much wind though, the temperature wasn’t too noticeable. I took off my over-trousers after deciding that I didn’t really want to risk getting too hot on the way down. We left the trig shortly after 2pm, and from there it was all down-hill through some very nice forest. At this point people began spreading out a bit according to everyone’s preferred walking pace, but we re-grouped every so often and arrived back at the river, at the bottom of the spur, at about 4.20 or so. From there it was a short walk back through the river to the road-end. Kapakapanui was an accessible trip and quite a manageable daywalk. It’s the first time I’d been there and I enjoyed it. Now I’d quite like to go back some time to see how quickly I can get around it. Maybe I’ll do this in a few months when I find a free weekend. 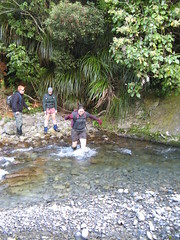 This entry was posted in daywalk and tagged altimeter, bagged:kapakapanui hut, daywalk, tararuas, wellington tramping and mountaineering club. Bookmark the permalink. enjoyed the views and the bush, complete with Goblin Forest.